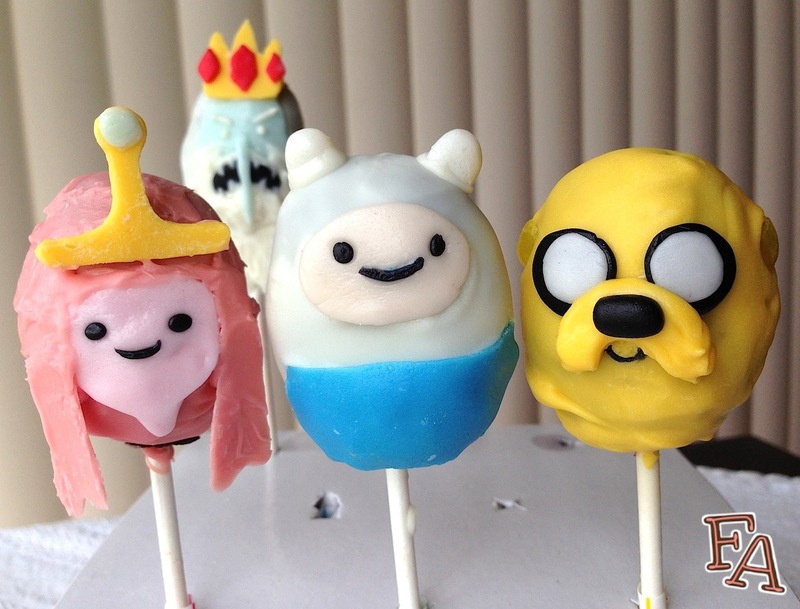 Adventure Time, c'mon grab your... cake pops! Welcome to my first attempt at cake pops! I think they turned out well. At least a few of them anyway. This was definitely a learning experience and I imagine it will go smoother next time around. I have some fun character pops in mind for the near future (^‿‿^). To make this how-to more organized and (hopefully) helpful, I've created sections that include a diagram of needed shapes for each of the character pops shown above. 1. 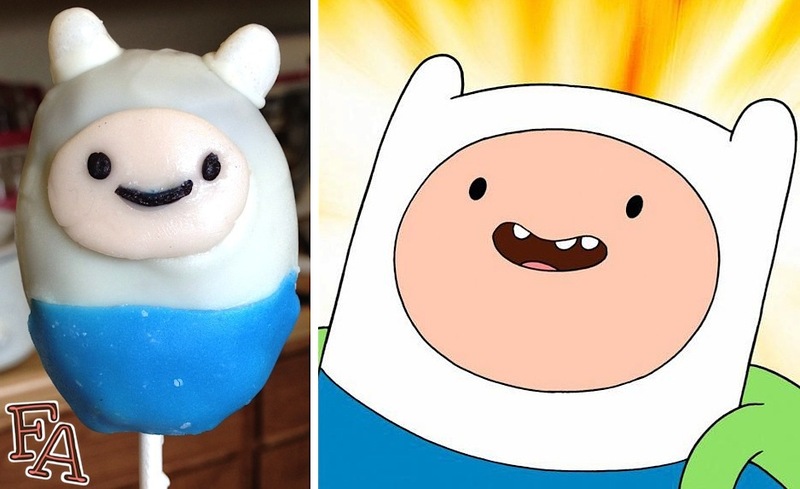 Cut a white Jelly Belly in half & attach the pieces to the top of the Finn pop's head to be the ears of his hood. You can do this while the chocolate is not yet hardened or you can attach them with little drops of melted white chocolate or white cookie icing. 2. Using pale peach fondant (a tiny bit of copper gel coloring), rolled out vanilla Tootsie Roll, or appropriate colored Laffy Taffy, cut out a small rectangle for Fin's face & then round the edges (leaning more toward oval). Using teeny pieces of black fondant OR a black food coloring pen create Finn's eyes & mouth. Affix the face to the cake pop using a tiny amount of melted chocolate or cookie icing. 3. IF you did not do the blue melt base with 2/3 white over it, roll out a strip of blue fondant or a blue Frootie roll & wrap it around the base of the cake pop, sticking it on with little dabs of melted chocolate or cookie icing. 1. When dipping Jake, before the yellow dries add a quarter cut yellow Jelly Belly to opposite sides of the head to create Jake's ears (round pointing down). 2. Roll & flatten two small balls of black fondant & then place two smaller flattened balls of white fondant on top to create Jake's eyes (see diagram below). Attach them to the cake pop using a tiny amount of melted chocolate or cookie icing. 3. Spoon a small amount of melted yellow chocolate into a candy decorating bag or sturdy plastic baggie with a very small snip out of the corner. 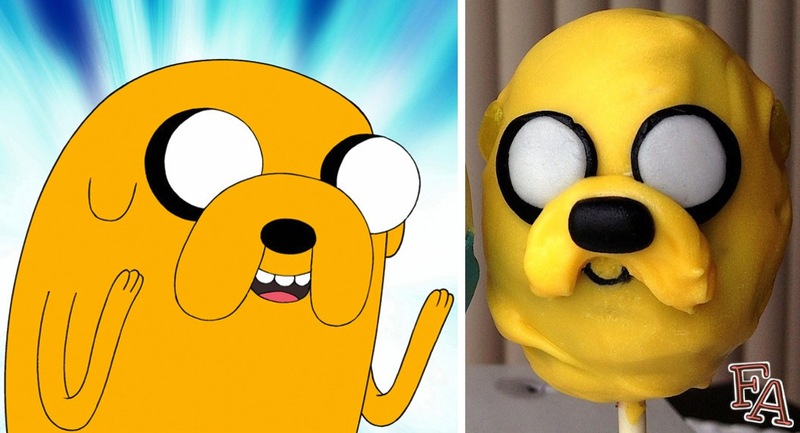 Lay the hardened Jake pop on its back, the front facing up, & carefully squeeze the yellow chocolate into a upside down "U" shape to form Jake's jowls, covering a tiny bit of the eyes. 4. Using a tiny rolled string of black fondant OR a black food coloring pen create a smiling mouth under/inside the jowls. 1. Put a small amount of melted pink chocolate into a candy decorating bag or sturdy plastic baggie with a very small snip out of the corner. On wax paper, pipe out two opposing sections of hair (see diagram below) & let harden. 2. 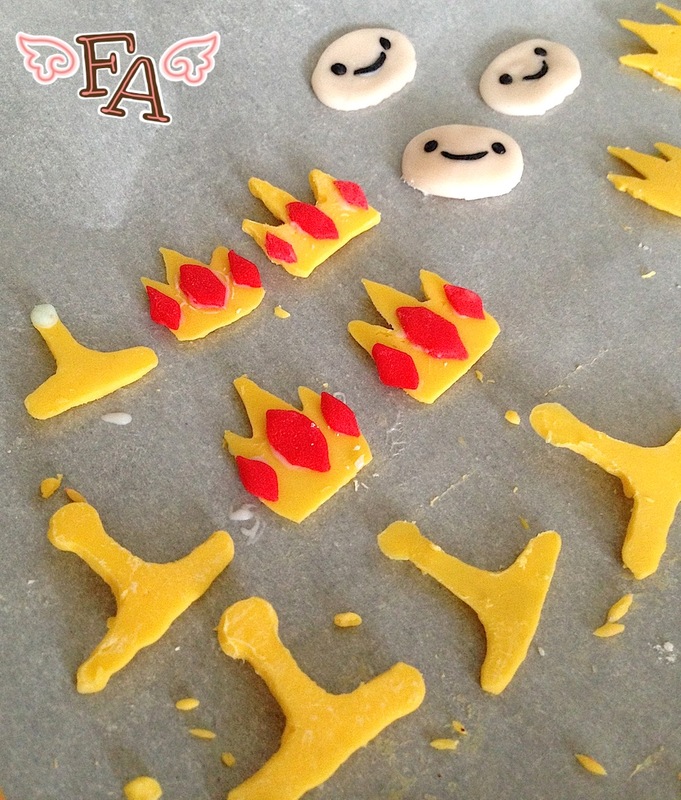 Using the same method, pipe out PBB's tiara using melted yellow chocolate shaping it as needed with a toothpick. Let it harden & then add a tiny flattened ball of pale blue fondant or Laffy Taffy to the top of the tiara using a teeny spot of melted chocolate or cookie icing. 3. Using very pale pink fondant or rolled out Laffy Taffy, cut out the shape for PBB's face, making sure to include her neck. Using teeny pieces of black fondant OR a black food coloring pen create her eyes & mouth. Affix the face to the cake pop using a tiny amount of melted chocolate or cookie icing. 4. Carefully remove the pink chocolate hair pieces using a metal spatula & attach them to the bottom of the cake pop on either side of the face using a small amount of melted chocolate. Using a toothpick, very carefully dab & smooth some melted pink chocolate around the face in a square & over the hair pieces to blend them into the rest of the pink chocolate "hair". 5. While the chocolate "hair" just above the face is still soft, carefully attach the yellow chocolate tiara. 1. Put a small amount of melted white chocolate into a candy decorating bag or sturdy plastic baggie with a very small snip out of the corner. On wax paper, pipe out the Ice King's beard (see diagram below) & let harden. 2. Using the same method, pipe out the Ice King's crown using melted yellow chocolate, shaping it as needed with a toothpick. Let it harden & then add the flattened gems using red fondant or rolled Frootie roll to the crown using a teeny spot of melted chocolate or cookie icing. 3. 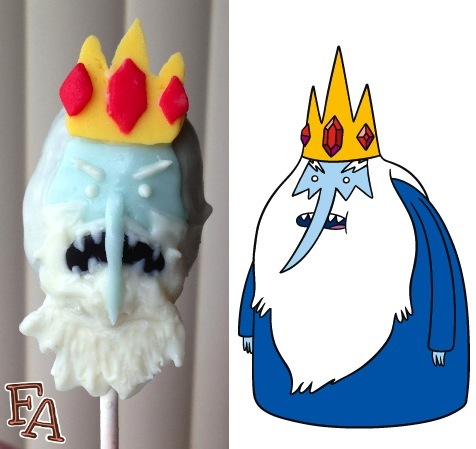 Using very pale blue fondant or rolled out Laffy Taffy, cut out the shape of the Ice King's face (see diagram below). Affix the face to the cake pop using a tiny amount of melted chocolate or cookie icing. 4. Carefully remove the white chocolate beard piece using a metal spatula & attach it to the bottom of the cake pop front using a small amount of melted chocolate. Using a toothpick, very carefully dab & smooth some melted white chocolate around the face, smoothing it over & blending it with the beard, & in a zig-zag under the eyes. Attach the black fondant mouth & pull white chocolate teeth onto it using the toothpick. 5. Create the eyes & eyebrows with the toothpick & melted white chocolate. Add the long pale blue nose with a tiny line of melted white chocolate or cookie icing down the Ice King's face. 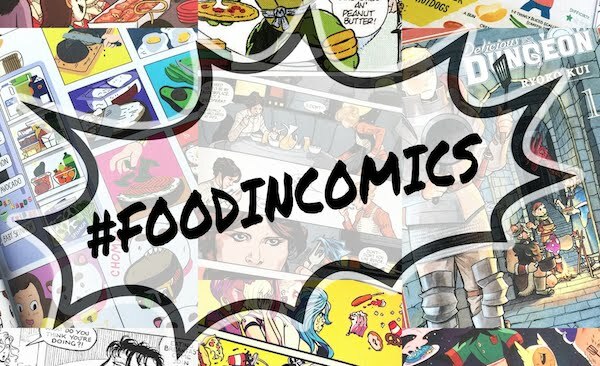 For more "Adventure Time" goodness try Jake's Bacon Pancakes & Finn's Meatloaf! Thank you! I've got several more character cake pops in mind for the future. 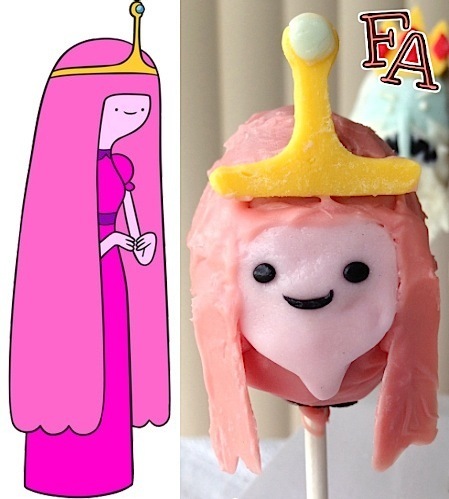 They’re so adorable that I don’t think I could ever eat them, especially Princess Bubblegum. Haha! You did a pretty great job for a first attempt. Sure, there are sides that need a little polishing, but the rest look amazing. Cheers! Haha, thanks! I definitely feel like I've learned more and gotten a little better at dealing with candy melts since this post, but these were fun to make as a first try. 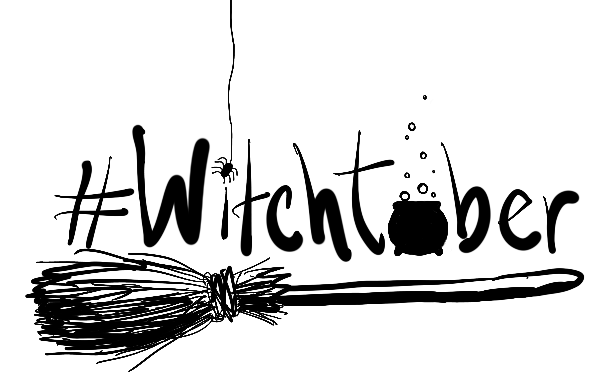 Thanks for the compliments and for visiting my blog!